Two astronomers at Columbia University in New York suggest humanity could use lasers to conceal the Earth from searches by advanced extraterrestrial civilizations. Professor David Kipping and graduate student Alex Teachey made the proposal in a paper in Monthly Notices of the Royal Astronomical Society. Several prominent scientists, including Stephen Hawking, have cautioned against humanity broadcasting our presence to intelligent life on other planets. Other civilisations might try to find Earth-like planets using the same techniques we do, including looking for the dip in light when a planet moves directly in front of the star it orbits. These events – transits – are the main way that the Kepler mission and similar projects search for planets around other stars. So far Kepler alone has confirmed more than 1,000 planets using this technique, with tens of these worlds similar in size to the Earth. Kipping and Teachey speculate that alien scientists may use this approach to locate our planet, which will be clearly in the ‘habitable zone’ of the Sun, where the temperature is right for liquid water, and so be a promising place for life. Hawking and others are concerned that extraterrestrials might wish to take advantage of the Earth’s resources, and that their visit, rather than being benign, could be as devastating as when Europeans first travelled to the Americas. 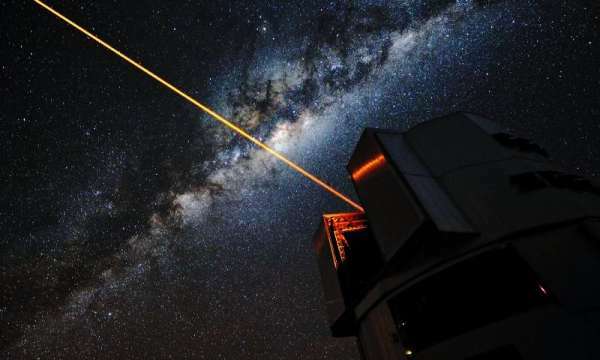 The two authors of the new study suggest that transits could be masked by controlled laser emission, with the beam directed at the star where the aliens might live. When the transit takes place, the laser would be switched on to compensate for the dip in light. According to the authors, emitting a continuous 30 MW laser for about 10 hours, once a year, would be enough to eliminate the transit signal, at least in visible light. The energy needed is comparable to that collected by the International Space Station in a year. A chromatic cloak, effective at all wavelengths, is more challenging, and would need a large array of tuneable lasers with a total power of 250 MW. “Alternatively, we could cloak only the atmospheric signatures associated with biological activity, such as oxygen, which is achievable with a peak laser power of just 160 kW per transit. To another civilisation, this should make the Earth appear as if life never took hold on our world”, said Alex. As well as cloaking our presence, the lasers could also be used to modify the way the light from the Sun drops during a transit to make it obviously artificial, and thus broadcast our existence. The authors suggest that we could transmit information along the laser beams at the same time, providing a means of communication. Given that humanity is already capable of modifying transit signals, it may just be that aliens have had the same thought. The two scientists propose that the Search for Extraterrestrial Intelligence (SETI), which mostly currently looks for alien radio signals, could be broadened to search for artificial transits.